Through Personal Testament, 'Why Religion?' Explores Belief In The 21st Century Distinguished scholar of Christianity Elaine Pagels sets out to explain why religion is still around today, through the lens of her lived tragedies — the deaths of her son and husband 30 years ago. Over many thousands of years, our understanding of the world has advanced exponentially. But our sense of mystery remains, and we still seek assurances that science and reason cannot provide. 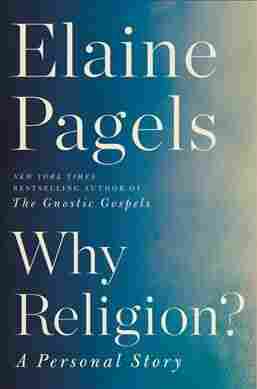 Elaine Pagels opens her new book with the question, "Why is religion still around in the twenty-first century?" As a distinguished scholar of Christianity, she obviously knows some academic explanations, but in Why Religion? A Personal Story she suggests a simpler, more poignant answer: It's because we suffer and need help. Pagels would know. Her two-year-old son developed a terminal lung disease and died at the age of six, plunging her and her husband Heinz into the depths of grief. Fifteen months later, Heinz died in a hiking accident, leaving his wife suddenly alone with a toddler and an infant and barely able to comprehend her losses, much less manage them through "those dark, nameless days and months." It is through the lens of her lived tragedies, 30 years later, that Pagels sets out to explain why religion matters. In her own case, she admits to some heresy. Though a Christian from an early age, her suffering did not make her especially devout, and strict believers may have trouble relating to her reading of scripture and her particular version of religious faith. But the story she tells is compelling and persuasive, and her nonsectarian perspective means her faith story will resonate with followers of various religious traditions. Having been raised by parents who regarded religion as obsolete, Pagels became an evangelical Christian as a teenager, after hearing Billy Graham preach of a "new life" at a Crusade for Christ rally in San Francisco. "'Born again,'" she writes, "I could break out of my family and enter into the family of a heavenly father who, unlike my earthly one, knew everything about me, even my secret thoughts — yet loved me unconditionally." Her disenchantment came soon thereafter, when her Jewish boyfriend died in a car crash, and her Christian friends told her he was going to hell as an unbeliever. That experience left her feeling that many evangelical Christians saw their religion as "a club for people spiritually superior to everyone who didn't share their beliefs. Numb, devastated, and alone, I left the church and never went back," she writes. Pagels still understood and respected the importance people give to their faith, however, and her curiosity about the origins of Christianity led her to the study of religion, first at Stanford and then at Harvard. Her professors introduced her to some ancient Christian texts discovered in Egypt in 1945, none of which had been included in the New Testament. Referred to as the "Gnostic Gospels" because of their emphasis on the importance of mystical knowledge and a direct experience of the divine, the secret texts were apparently written by early followers of Jesus at about the same time, or a little later, as the gospels that made it into the Christian Bible. "Even a first dive into them showed that what we call 'Christianity' is a huge, messy heap of traditions, stories, images, and practices, collected by people all over the world," Pagels writes. It was a story she was eager to share. The Gnostic Gospels, the first book she wrote for a popular audience, was a bestseller. Pagels's initial interest in those scriptural texts, however, was largely academic. This was a period when she was almost completely separated from church life. After the tragic death of her son Mark, Pagels was emotionally devastated, and her Christian friends managed only to infuriate her when they suggested there was a "spiritual lesson" to be learned from the boy's death. The book she was writing at the time of his death, Adam, Eve, and the Serpent, ended with an angry critique of St. Augustine's claim that "original sin" infected the whole human race. It was only when Pagels dug more deeply into the secret gospels that she began to re-engage with Christianity. In one of those ancient Gnostic texts, the Gospel of Thomas, Pagels found some relief from her previously unbearable grief. She quotes from the text: "Within a person of light, there is light. If illuminated, it lights up the whole world; if not, everything is dark." Such verses, she writes, "helped dispel isolation and turn me from despair. ... Instead of seeing suffering as punishment, this gospel suggests that, seen through the eyes of wisdom, suffering can show how we're connected with each other, and with God." At the time, she had been struggling to deal with the loss of her son and husband. "I had to divest myself of the illusion that we deserved what had happened," she writes. "I was living in a world where volcanoes erupt because that's what volcanoes do, regardless of whether anyone in their path is good or evil, and in which children often die young for no reason we can find." This was what Pagels personally needed to see and learn: That suffering is "an essential element of human existence." This realization brought her a measure of peace, and she credits the ancient gospels she encountered. She concludes that scripture was written to help people deal with what they could not otherwise accept. In the end, it worked for her. Pagels's book is therefore a personal testimony, but it simultaneously reflects her scholarship as a student of the ancient texts. It is that combination that makes her story distinctive and gives it unusual power. Pagels was able to return to religion because she realized that the rigidity and judgmentalism she encountered in her early church life was not all there was to Christianity. In the Gnostic gospels, she found a much more appealing and helpful version. Pagels's interpretation of what it may mean to be a Christian, however, is clearly unconventional. She acknowledges that the gospel writer whose thoughts she found most helpful sees suffering "as Buddhists do." She barely mentions Jesus Christ and does not discuss the need for personal salvation, as evangelicals routinely do. When she began to conclude that the Christian tradition contained "much that may be of value, and much that may not," a self-described "Bible-believing" Christian scolded her. "Picking and choosing is self-indulgent," he said. "We call it cafeteria Christianity, since people who do that simply refuse to accept the whole tradition as it stands." But whether her spiritual understanding aligns with more familiar expressions or not, Pagels' faith is genuine. At the end of her book, she sees a power larger than herself at work in her life. "However it happens," she writes, "sometimes hearts do heal, through what I can only call grace."